As for Aliens, we look to the IRS definition of the term, in which we in today’s terminology would classify the Braves opponent that day as a non-resident aliens: the Australian Baseball Tourists of 1897. As for the Old Timers, the box score shows many of the best of the 19th Century Braves. While all baseball fans know of George Wright, and AG Spalding, and former Braves players Tommy Bond, Jack Manning and Harry “Silk Stockings” Schafer and Andy Leonard were once household names. Others were not, such as Harry Ayer who remains unknown to baseball-reference.com to this day, and others lost to history, such as the third Wright Brother of baseball, Sam Wright, a career .168 average no doubt helps. As for the Magnates, the superlatives associated with this game continue beyond the players. The official scorer was the inventor of the Box Score, Hall of Famer Henry Chadwick. The umpires were team owners: the infamous magnate. Tammany Hall operative and team wrecker of the Orioles and Giants, Andrew Freedman, and former Braves owner George Appleton who called the bases. What would be today’s equivalent? The Boss behind the plate, Ted Turner calling the bases? As for “the Gun,” this game was a live test of a horribly bad experimental piece baseball equipment known as either Prof. Hinton’s Pitching Cannon or the Princeton Pitching Gun. It was developed by Oxford educated and Princeton Mathematics and baseball fan, Professor Charles W. Hinton. This contraption was part cannon, part rifle, electric battery, and thoroughly and completely terrifying. 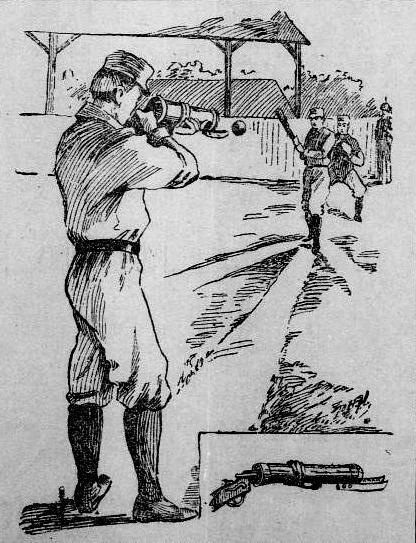 Powered by a .38 caliber cartridge, it shot baseballs in the general direction of helmetless batsmen. The muzzle length was adjustable, allowing for fast balls or change ups, and the ball could be made to curve, drop or slide by adjusting its “leather” fingers. 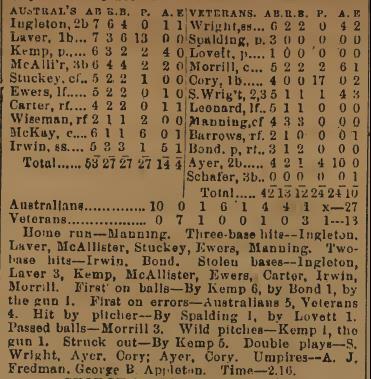 The box score indicates that one major issue was control, as “the Gun” was credited for one wild pitch, and one walk, and allowed four runs in two innings of game finishing relief work. We also have three passed balls by a typically sure handed Honest John Morrill. These old Red Stockings – Beaneaters were exemplary nineteenth century gentlemen of the highest order, as their ten recorded errors enabled a 27-13 Aussie Victory. It was one of just a handful for the tourists. Nevertheless, the Sydney Morning Herald called the trip “A Total Failure” and this day has been lost and forgotten. Australian baseball is still recovering from the aftershocks of the trip. While taking the field armed with pitching cannon, might redefine the term international friendly; due to their generosity and hospitality, both on the field and off, these old Braves understood the game of international baseball.